What limits regenerative ability during aging? How do systemic factors affect regenerative ability? Contrary to the longstanding view that newts (Notophthalamus viridescens), but notaxolotls (Ambystoma mexicanum), can regenerate a lens, a recent report in BMC Biologyby Panagiotis Tsonis and colleagues shows axolotls indeed possess this ability during earlylarval stages. In contrast, they show that zebrafish never posses this ability, even as embryos.This underscores the importance of comparing regenerative ability across species and reinforces theneed to consider organ regeneration in the context of evolution, development, and aging. New insights in regenerative biology will continue to arise from studies of animal models thatpresent a diversity of regenerative responses. To better leverage these models, it will be importantto consider regenerative ability within the context of evolution, life history, physiology, anddevelopment . Here we highlight a long-standing problem, the loss of regenerative ability as anorganism ages. Considering this fundamental relationship between aging and regeneration in naturallyregenerating systems may help translate new discoveries into effective applications in regenerativemedicine. While humans possess varied and diverse mechanisms for physiological regeneration - regenerationto maintain and renew organ functions throughout life - this renewal declines with age; furthermore,we possess a very limited ability for the regeneration of tissues following injury. Enviously, wewatch flawless regeneration of limbs, lens, retina, spinal cord, brain, heart, and neuro-sensorycells, seemingly throughout life, by distant vertebrate relatives. There are, however, limits to theability of any organism to regenerate, and understanding these limits may be the key tounderstanding why humans cannot regenerate whole organs. Although examples of tissue regenerationare rare among birds and mammals, tissue regeneration occurs in amphioxus, the most basal livingchordate . This suggests that humans likely share mechanisms that are used by salamanders and othervertebrates to regenerate organs. Salamanders provide a good stepping-off point for consideringfactors that limit regenerative ability because they present a basal tetrapod condition that mostclosely approximates ancestral lineages leading to amniotes. To understand why and how regenerative ability varies across ontogeny and phylogeny requires acomparative approach that evaluates regeneration of homologous structures throughout development,preferably using species that diverged from a common ancestor. Unfortunately, few rigorous studieshave examined regeneration throughout development. 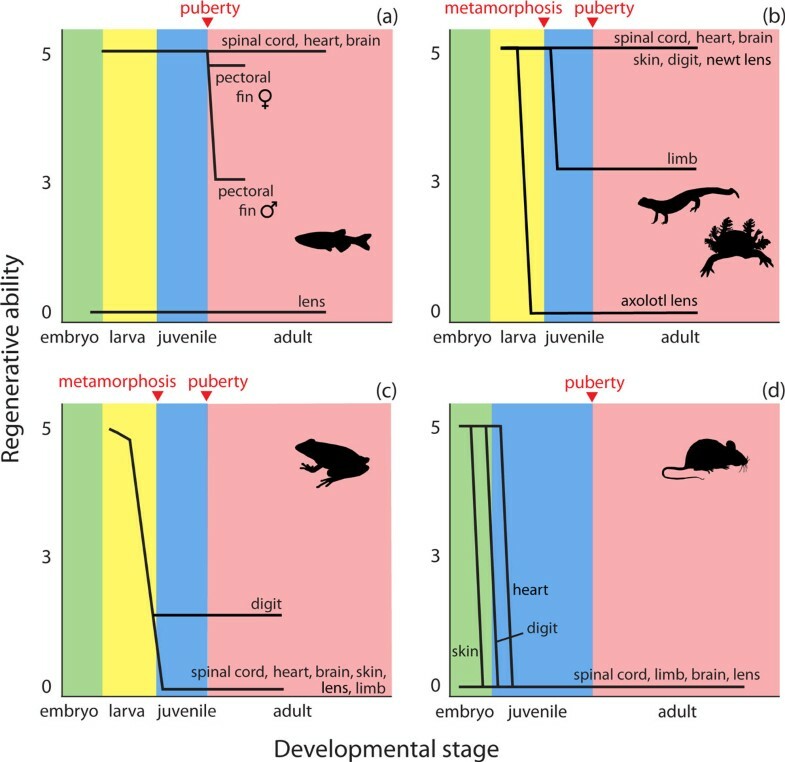 Still, ontogenetic changes in regenerativepotential have been described for a few species and several lines of evidence support the idea thatembryos, larvae, and juveniles of many species have greater potential for tissue repair andregeneration than adults (Figure 1). Frogs and mice, for example, are capableof regenerating skin during early life stages but lose this ability later in development, whileaxolotls retain the capacity for skin regeneration even after metamorphosis ( and references therein). Similarly, the ability of zebrafish to regenerate pectoral finsand frogs to regenerate limbs is reduced in older animals, while heart regeneration appearsunaffected even in very old fish ([1, 4] and references therein). Adding to these studies, a report by Suetsugu-Maki etal. now shows that axolotls can regenerate a lens during early life stages, while mostvertebrates cannot regenerate lenses at all. And yet, newts are capable of lens regenerationthroughout life and if the progenitor cells that restore lenses in non-regenerating species,including humans, are cultured in vitro, cells with lens phenotypes differentiate . Thus, while the potential for lens regeneration is apparently a shared derived trait ofvertebrates, that potential is restricted during development in most species. Together, theseexamples suggest that even in some salamanders with boundless regenerative abilities, constraintsimposed by aging, either at the physiological or cellular level, work to limit regenerative capacityin organ- and species-specific manners. Reparative regeneration as a function of developmental stage among vertebrate models ofregeneration. Panels depict how the regenerative ability of homologous structures varies acrossontogeny for the primary vertebrate models of regeneration. Regenerative ability is presented on a 0to 5 scale; five represents perfect regeneration and zero no regeneration. Major ontogenetic stagesare represented as embryo, larva, juvenile and adult with metamorphosis, puberty or both indicatedfor each species. (a) Zebrafish exhibit lifelong regenerative capacity of spinal cord, brain,and heart. They cannot regenerate a lens at any time in development and while pectoral fins(homologous to tetrapod limbs) regenerate in juveniles, their regenerative capacity is reducedfollowing puberty, with females retaining a higher capacity for complete regeneration. (b)Salamanders and newts are the archetypical tetrapod regenerator, retaining near perfectregeneration of most organs and appendages well into adulthood (although almost no studies havetested these abilities in old animals). They do, however, experience a decline in limb regenerationfollowing metamorphosis, which usually manifests as patterning defects and loss of limb elements.Axolotls can only regenerate lenses as early stage larvae. (c) Although most frogs exhibitsome degree of regeneration as larvae, with the exception of limited digit and very restricted limbregeneration in some species, they do not exhibit regenerative ability as adults. (d) Mammalsexhibit some regenerative capacity as embryos but lose almost all of this ability before or shortlyafter birth for the structures listed. Understanding how aging changes cells, tissues, and physiological systems is key to identifyingmechanisms that limit regenerative ability. During both development and regeneration, relativelyundifferentiated cells become specified to form organs that then undergo tremendous growth, but theoverall process differs between the two. Regeneration is activated in response to injury, dependsupon tissue-specific progenitor cells, and occurs under physiological conditions and within anextracellular environment that differs from the embryonic state. Embryonic cells have greatpotential for cellular reprogramming, and cellular reprogramming through epigenetic modificationsand changes in transcription are associated with regenerative responses . During development, cells exhibit changes in transcription that limit signaling pathwaysassociated with cellular plasticity. For example, cells differentiate and lose the ability to enterthe cell cycle, both of which must be reversed for limb regeneration to occur in salamanders. Themaintenance of plastic cellular states and cell-cycle re-entry are likely associated with theactions of tumor suppressor proteins like retinoblastoma protein (RB), the levels and activationstates of which are known to vary during regeneration in salamanders and across developmental stagesin mammals [8, 9]. Taken together, studies suggest that the abundances of key regulatory molecules arepermissive for cell cycle re-entry from a quiescent state in young life stages, but restrictive asan organism ages, and this limits regenerative ability. Future studies that quantify levels of suchmolecules in young and old salamanders may shed new light on progenitor cell activation,regenerative ability, and potentially, diseases of aging such as cancer. Early, heightened cellular plasticity in response to injury reflects not only local but alsosystemic factors that are difficult to disentangle without ontogenetic perspective. The importanceof systemic factors is dramatically shown in studies of parabiotic mice that differ in age but sharethe same circulatory system. Serum from young animals stimulates older muscle to regenerate andserum from old individuals decreases the regenerative capacity of young muscle . A similar phenomenon was noted in the ability of a young systemic milieu to rejuvenateaged oligodendrocyte precursor cells and promote remyelination of axons in old mice . While these studies provide further support for the idea that regenerative potentialcorrelates negatively with aging, they also show that regeneration is not simply a local property ofcells and tissues. Instead, regeneration also depends upon blood cells and serum factors that havebroad access to tissues and progenitor cell niches - and the properties of these cells and factorschange during development. Many animals undergo post-embryonic growth and developmental phases that commence in response tocirculating hormones that are released at relatively specific times during ontogeny. In the case ofamphibian metamorphosis, thyroid hormone (TH) reprograms juvenile cells and activates adultprogenitor cells, and this brings about the conversion of tadpole aquatic larvae into moreterrestrial adults. Interestingly, while newts always undergo metamorphosis, axolotls rarely dounless treated exogenously with TH . Future studies that use hormones to induce metamorphosis at different times duringontogeny may be able to disentangle the effects of aging from intrinsic regenerative ability, as ithas already been shown that prolonging the larval state enhances regenerative ability compared tosame-aged animals that have undergone metamorphosis . In coming years, we envision a new, golden age in regenerative biology. Animals present adiversity of regenerative responses that vary across organs, developmental stages, and phylogeny.Increasingly, advances in genetic and genomic technologies will make it possible to compareregenerative responses within and among animal models to identify factors that cause regenerativeability to change with aging. We thank Megan Seifert for helpful comments on the manuscript and figure. We apologize to authorswhose work was not cited due to space constraints. This article is published under license to BioMed Central Ltd. This is an Open Access article distributed under the terms of the Creative Commons AttributionLicense (http://creativecommons.org/licenses/by/2.0), which permits unrestricted use,distribution, and reproduction in any medium, provided the original work is properly cited.